Penetrometer to test the penetration of dental alginate impression materials and soft materials for removable dentures, ISO 21563 / 10139. The penetrometer is equipped with a cylindrical penetratoin rod, a dial indicator and a spindle with penetration needle to test the penetration into different dental materials. 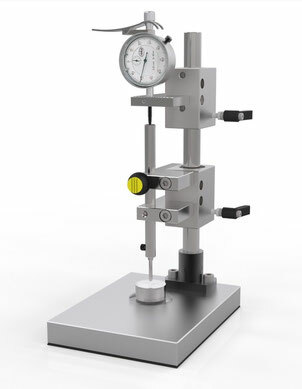 The test device fillfiled are according the requirements of ISO 21563 / 10139.